By 1989, Hiroshima was preparing to release their much-anticipated sixth album East, which was the followup to 1987s Go, which was the most successful album of the band’s ten year recording career. For Hiroshima, East and Providence which was recently reissued by BGO Records as a two CD set, were the next chapters in their career. Dan Kuramoto who had founded Hiroshima in 1974, hoped that the success they had been enjoying would continue. For Dan Kuramoto who had founded Hiroshima in 1974, the last fifteen years had been a roller coaster ride. Much had happened to his group, including a number of changes in Hiroshima’s lineup. However, everything paid off in 1979, when Larkin Arnold had signed Hiroshima to Arista. This was what Hiroshima had been working towards over the last five years, and they decided to grab the opportunity with both hands. Later in 1979, Hiroshima released their eponymous debut album which sold over 100,000 copies in the first three months, and eventually peaked at fifty-one on the US Billboard 200. Buoyed by the success of Hiroshima, the irresistible Room Full Of Mirrors was released as a single and reached eighty in the US R&B charts. However, by then, Room Full Of Mirrors was a favourite within the easy listening community and introduced Hiroshima’s music to a new and wider audience. Following the success of their eponymous debut album, Hiroshima returned with their sophomore album Odori in 1980. It reached seventy-eight on the US Billboard 200 during an eighteen week stay on the charts. By then, the lead single from Odori was Warriors, which gave Hiroshima a minor hit single when it charted at seventy-nine in the US R&B charts. This was the last hit single Hiroshima enjoyed at Arista. Fortunately, Larkin Arnold hadn’t forgotten about Hiroshima, and by 1983, they signed to Epic and in 1983 released their third album Third Generation. It was their first album to make use of drum machines and synths, as Hiroshima had been later to embrace the new technology which transformed their sound. Despite that Third Generation stalled at 142 in the US Billboard 200 and fifty in the US R&B charts. However, when San Say was released as the lead single, it reached sixty-eight in the US R&B charts and became Hiroshima’s biggest hit single. For Hiroshima this was a small crumb of comfort, as their thoughts turned to their fourth album Another Place. Another Place had sold over 500,000 copies and was certified gold. This meant that Another Place was the most successful of Hiroshima’s four album career. Now Hiroshima had to replicate the success of Another Place. This wasn’t going to be easy, but the members of Hiroshima were determined to build on the success of Another Place. When Hiroshima returned in the autumn of 1987 with Go, it was hailed as one of Hiroshima’s finest albums, and a fitting followup to Another Place. Go which means five in Japanese, was released in autumn 1987, reached seventy-five in the US Billboard 200 and fifty-four in the US R&B charts. This was enough for the second gold disc of Hiroshima’s career, and became their most successful album. After the success of Go, Hiroshima were asked to create a musical play which told the story of the band. This was a surprise even despite Hiroshima’s recent success. While they had two gold discs to their name, many record buyers still hadn’t heard of Hiroshima. Part of the problem was that Hiroshima were unlike many bands, and didn’t fit neatly within one musical genre. Instead, their music straddled several genres and combined different cultures. In doing so, Hiroshima a band that reflected both American and Japanese cultures, created ambitious, genre-melting music. This was a story that deserved to be told. Dan Kuramoto, agreed to write and perform a musical play that told the story of his band Hiroshima. The play eventually became San Se, which in Japanese means third generation. This was apt, as Dan Kuramoto and Danny Yamamoto’s were both third generation. Once San Se was written, both men were became part of Hiroshima’s next success story. When Hiroshima took to the stage at the 850 seat Music Centre in downtown LA, on the first night of the San Se’s run, little did anyone know the impact the play would have. Not only did San Se with its inclusive narrative strike a chord from Americans who came from immigrant families, but San Se was a roaring success. Even today, it’s still the second or third generation play at the Music Centre. Hiroshima’s success story continued apace. Following the success of San Se, Hiroshima began work on their sixth album, which eventually became East, where the band decided to celebrate their Asian roots. Each member of Hiroshima were from immigrant families, and had grownup in the ghettos. This commonality brought the band together and was something they share and could relate to as they began work on their sixth album. Before that, Hiroshima had to bring onboard a new vocalist as Barbara Long, the band’s previous singer had left after having a baby. Fortunately, the band knew the perfect replacement, and someone with an impeccable musical pedigree Margaret Sasaki-Taylor a.k.a. Machum. She was born in Japan, but had moved to America as a six-year-old. Before long, Machum had discovered music, and was following in the footsteps of her grandmother who was a Japanese koto master. Having discovered the koto, Machum went on to become one of its finest exponents, and by the time she joined Hiroshima, was recognised and regarded as a virtuoso musician. Despite her skills as a musician, Machum had been one of Pink Floyd’s backing vocalists on The Wall tour. Now that the tour was over, she was free to join of Hiroshima and become their vocalist. For their sixth album Hiroshima decided to include some of the songs that had featured in their musical San Se, including Thousand Cranes. These tracks were augmented by some new ones. Again, founder member Dan Kuramoto was Hiroshima’s songwriter-in-chief penning East, Streetcorner Paradise, Come To Me and You and Me. He wrote Midtown Higashi with Danny Yamamoto, Johnny Mori and June Kuramoto; Tabo with Darrell Yoshihara; Living In America with Dean Cortez and Thousand Cranes with Derek Nakamoto. June Kuramoto and Kimo Cornwell wrote Daydreamer, while The Golden Age was a song penned and co-produced by Skylark who later, joined the Doobie Brothers in 1995. These song became East, which was Hiroshima’s sixth album. Recording took place in LA, at Sunset Sound Factory and Sunset Sound Factory, where Hiroshima were joined by a few friends. By now, Hiroshima was a five piece band led by Dan Kuramoto who played keyboards, synths, flutes, saxophones, programmed synths and drum machines and added backing vocals. Danny Yamamoto played drums, percussion, keyboards, synths and was involved in programmed synths and drum machines. June Kuramoto played koto and shamisen, while Johnny Mori played taiko and percussion. New recruit Machum played guitar and sung lead vocals. Augmenting the new lineup of Hiroshima were a few friends. Joining Hiroshima was bassist and backing vocalist Dean Cortez; guitarist and backing vocalist TJ Parker and keyboardist Kimo Cornwell who played and programmed synths. The trio was joined by vocalists included Augie Johnston, Jim Gilstrap, Lillian Tynes, Marva Barnes, Phil Perry and Phillip Ingram. These talented musicians and vocalists played their part in the sound, and hopefully, the success of East, when it was released in 1989. When East was released in 1989, it was to plaudits and praise, as critics welcomed an album where Hiroshima celebrate their Asian roots. However, East was also an album where Hiroshima continued to fuse Asian and American influences on what was a slick, carefully crafted and genre-melting music. On East, Hiroshima combined tradition Western and Eastern instruments with the technology that was transforming music. Synths and drum machines were deployed effectively on East, where Hiroshima combined everything from AOR and avant-garde, to electronica, funk, jazz, New Age, pop, R & B and rock. The result is an album where East meets West musically. East opens with Midtown Higashi where a recordings of everyday city life gives way to what’s best described as an avant-garde, New Age instrumental. It’s followed by another instrumental, East where Hiroshima celebrate the cultural diversity of America in 1989. In doing so, that combine traditional Eastern instruments and influences with elements of electronica, funk, jazz and rocky guitar licks. Tabo makes Machum’s debut on this smooth and soulful sounding track where the new vocalist delivers one of the best vocals on the album. Machum returns on Living In America where her heartfelt vocal adds the finishing touch to this fusion jazz, funk and rock. With its carefully crafted, slick sound where East meets West, Daydreamer, a beautiful, memorable instrumental almost heads in the direction of smooth jazz. The tempo rises on The Golden Age, as Machum takes charge of the lead vocal. It veers between tender and impassioned to coquettish, but is always soulful. Streetcorner Paradise is another instrumental and again, and floats along its slick and smooth sound a successful marriage of Eastern and Western influences. On the beautiful ballad Come To Me, Machum combines emotion and sincerity as she delivers a soulful vocal masterclass while Japanese instruments add the finishing touches to this cross cultural collaboration. Straight away, You and Me has a real eighties sound, but it’s a track that has stood the test of time. Maybe that is due to the fusion of Eastern and Western instruments and influences that play their part in this musical potpourri? Closing East, is Thousand Cranes a poignant and thought-provoking song that originality featured in the play San Se. When East was released in 1989, the album stalled at 105 in the US Billboard 200, and failed to even trouble the US R&B charts. This was a huge disappointment for Hiroshima as this carefully crafted album was slick, melodic and had many memorable radio friendly songs. 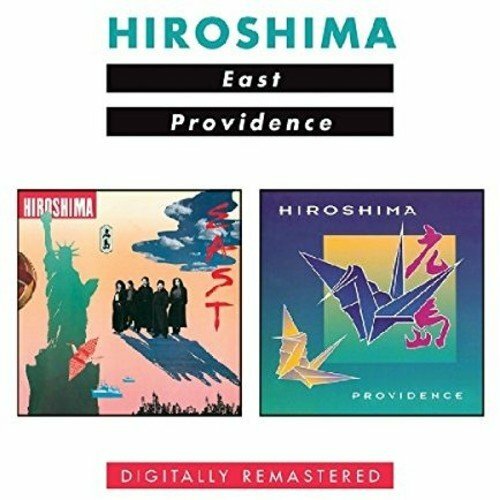 East was the one that one that got away for Hiroshima, who really needed their seventh album Providence, to be a success. Following the disappointing sales of East, Hiroshima weren’t tempted to rush out their seventh album Providence. Instead, it was three years before they returned with the followup East. 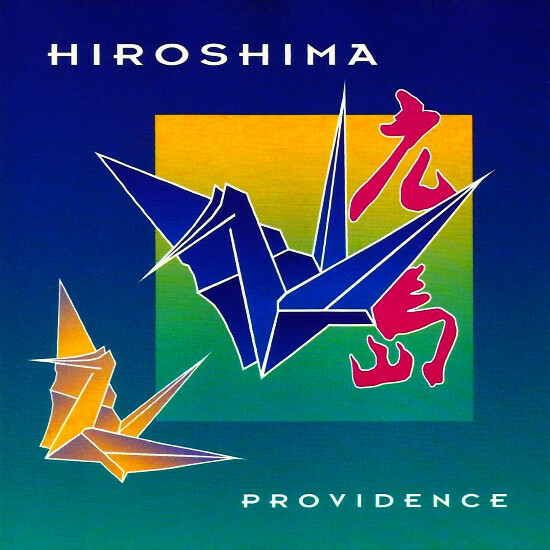 Providence, the members of Hiroshima must have known was the most important album of their career. They only owed Epic one more album, and if Providence wasn’t a commercial success there was every chance that their contract wouldn’t be renewed. There was no sentiment in music, even though two of the four album Hiroshima released for Epic had been certified gold. For Hiroshima Providence was make or break. This time around, Dan Kuramoto wrote five of the ten tracks and cowrote the other two. He also wrote Time On The Nile with Kimo Cornwell, while the pair wrote Island World with Dean Cortez. The other track on Providence was the June Kuramoto composition Turning Point was joined by a cover of Stevie Wonder’s Ribbon In The Sky Just and Diane Louie’s One Of Us. Just like the rest of the album, these cover versions were recorded in familiar surroundings. Despite East’s failure to match the sales of Another Place and Go, recording again took place at Sunset Sound Factory and Sunset Sound Factory in LA. By then, Hiroshima was a seven piece band with bassist and backing vocalist Dean Cortez; keyboardist Kimo Cornwell who played and programmed synths joining new vocalist Jeanette Clinger, who had beaten off stiff competition to become Hiroshima’s new vocalist. However, the newcomer had a lot to live up to after Machum’s contributions on East. As recording began, founder, bandleader, producer and keyboardist Dan Kuramoto programmed and played synths, flutes, saxophones, shakuhochi and added backing vocals. Danny Yamamoto played drums and taiko; June Kuramoto played koto and shamisen, while Johnny Mori played taiko and percussion. The new lineup seven pice of Hiroshima was augmented by a guitarist Allen Hinds and percussionist Richie Gajate Garcia when Providence was recorded. 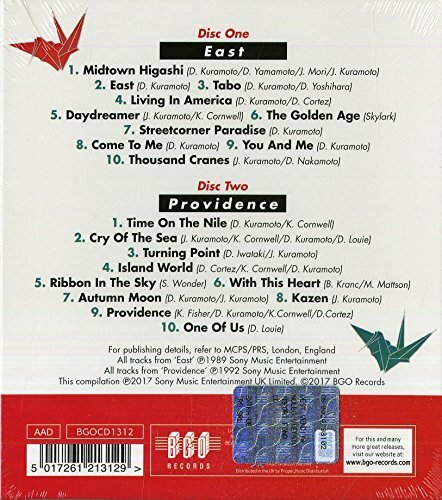 Prior to the release of Providence in 1992, critics had their say on Hiroshima’s seventh album. 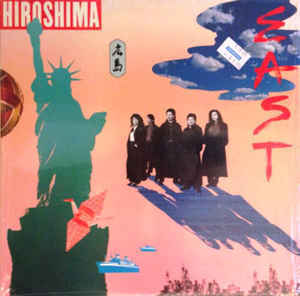 Just like East, the album caught the imagination of critics who were won over by Hiroshima’s first album in three years. Opening Providence Time Of The Nile, which dedicated to Miles Davis, and was a track he would’ve approved of as it seems to have been inspired by his 1986 comeback album Miles. It starts off as an atmospheric and dreamy mood piece, before becoming a jazz workout that allows Hiroshima’s new lineup to showcase their considerable skills. The ballad Cry Of The Sea finds new vocalist Jeanette Clinger making her Hiroshima debut as she delivers a tender, heartfelt and wistful vocal. By the end of the song, it looks like Hiroshima have found the perfect replacement for Machum. Slow, smooth and carefully crafted describes the ruminative sounding Turning Point which allows time for reflection. Gradually, the instrumental reveals its secrets as Hiroshima combine American and Japanese as the arrangement builds before reaching a memorable crescendo. It’s all change on Island World where the tempo rises as musical shape shifters Hiroshima flit between Caribbean influences and Latin jazz. In doing so, they pay homage to the many Latin musicians they played alongside in LA. Very different is the ballad Ribbon In The Sky, which features Jeanette Clinger at her most soulful. This she does against a slow, subtle arrangement which sometimes, becomes jazz-tinged before Hiroshima fuse American and Japanese influences. With This Heart heads in the direction as Jeanette Clinger picks up where she left off on Ribbon In The Sky and plays a starring role. Meanwhile, Dan Kuramoto’s scorching saxophone and Dean Cortez’s slapped bass play supporting roles on one of the highlights of Providence. So too is the rueful dreamy, shimmering sounding instrumental Autumn Moon. It gives way to Kazen a short soundscape that lasts just forty-one seconds and acts as a bridge to Providence, which marks the return of Jeanette Clinger. Her powerhouse of a vocal reflects on the subjects of fate and destiny, while the arrangement is variously funky, rocky, percussive and jazz-tinged. It’s as if Hiroshima are determined to end the album on a high. They do with One Of Us which was a stirring and inspirational anthem-in-waiting which ended the album on a high. Surely this would lead to a change in Hiroshima’s fortunes? Sadly, that wasn’t to be. When Providence was released in 1992, the album was a commercial failure, neither troubling the US Billboard 200 nor the US R&B charts. For Hiroshima, this was the end of the road at Epic. They decided to leave Epic, as they had fulfilled their contractual obligations. The Epic years had been the most successful of Hiroshima’s career, and saw 1985s Another Place and 1987s Go certified gold. Sadly, Hiroshima were unable to build on this, and neither East nor Providence enjoyed the same success. Instead, East and Providence which were recently remastered and reissued by BGO Records as a two CD set, feature two underrated hidden gems from Hiroshima’s back-catalogue. Both East and Providence are carefully crafted albums from Hiroshima, a multitalented band. They combined traditional Western and Asian instruments with the latest in musical technology on both East and Providence. This rested in Hiroshima’s innovative genre-melting sound that incorporated everything from ambient and avant-garde, to funk, fusion and jazz-funk, to pop, R&B and rock. There’s even diversions via electronic, New Age and tech-funk while Hiroshima incorporate elements of Asian and Japanese music to their music. Sadly, despite the music on East and Providence being of the highest quality, it failed commercially. For Hiroshima it was the end of an era. Hiroshima left Epic after the commercial failure of their seventh album Providence. When they returned with their eighth album LA in 1994, they had signed to Qwest Records which was a join venture between Warner Bros and sixty-one year old Quincy Jones. Sadly, for Hiroshima, they never enjoyed the same success at Qwest Records than they had at Epic, which was where they enjoyed the most successful period of their long and illustrious career. Of the five albums Hiroshima released on Epic, 1985s Another Place and 1987s Go critically were by far the most successful. However, East and Providence are two underrated and oft-overlooked hidden gems which features the multitalented Hiroshima at their most versatile as they flit between anthems-in-waiting to tender ballad and uptempo dance tracks. ← BEST NEW ALBUMS OF 2017-PART 1.